To protect the civil rights of the disabled, the Americans with Disabilities Act (ADA) was passed by Congress and implemented in the early ‘90s. As it pertains to signs, the goal of the law is to guarantee access to services and goods by requiring identification standards for readability, such as sign location, character size and font, tactile copy, color contrast, and more. There is a lot of confusion surrounding the ADA. To help clear things up for you, we have put together this ADA sign FAQs for Los Angeles businesses. Do I need to make all of my signs ADA markers? Which signs do have to be ADA compliant? 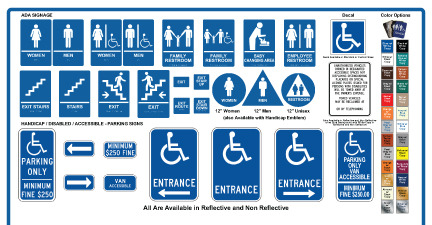 You must have ADA compliant signs providing identification for all permanent spaces and rooms. Safety signs identifying doors at stairwells and passageways are required to have ADA signs that include Braille copy and raised characters. ADA guidelines should also be followed with flag mounted, wall mounted, and overhead signs that identify or direct, but these do not require tactile copy. Are numbers or names needed to identify spaces? Restrooms, kitchens, and other rooms that have equipment that cannot be moved easily must be identified by name. Alphanumerical labels are acceptable for cubicles, offices, and other spaces that may change. What exactly are raised characters according to the ADA? Characters must not have abrasive or sharp edges. The guidelines also specify that raised letters should be a sans serif copy style, uppercase, 1/32” minimum above their background, and characters can’t be highly decorative, oblique, extended, of unusual form, script, italic, or expanded. Raised characters must be between 5/8” and 2” high. What are the visual character requirements? Guidelines for visual characters must be followed for signs that offer safety or direction. The guidelines for visual characters and their backgrounds are they must have lower case or upper case or a combination of both, non-glare finish, a conventional copy style, high contrast with their background, and characters that are not highly decorative, oblique, extended, unusual in form, script, italic, or expanded. 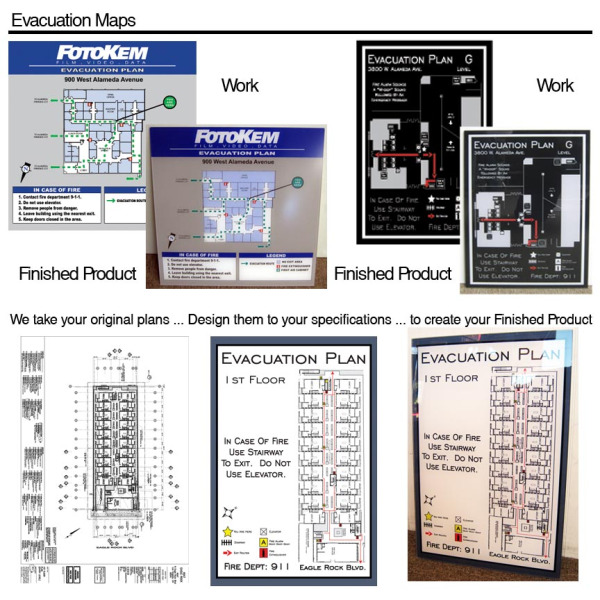 Are evacuation maps required in my building? In California, evacuation maps are a must. In this map, be sure to include a floor plan with outside meeting locations, an evacuation route, emergency protocols, locations of areas of refuge, and locations of safety items. You are not required to have Braille or raised characters for evacuation maps. If you have other ADA sign FAQs for Los Angeles businesses that are not listed here, please do not hesitate to contact The Sign Studio. We are the experts when it comes to ADA signage. 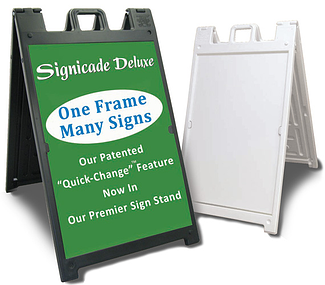 We can even help you determine what ADA signs you need for your specific venue. There are a lot of messages vying for consumers’ attention these days. If you really want to catch eyes, you have to utilize the perfect combination of cleverness and talent. This is especially true in the signage industry. Every business wants their sign to be the one shoppers notice. Some are more successful than others. In this entry, we will cover some of the most effective marketing signs for Glendale, CA. There are two main attention grabbing signage alternatives that are held by volunteers or employees: spinner signs and sandwich boards. First let’s talk about the modern sandwich board. It used to be that you would hire a guy to wear a sign on his front and one on his back with straps on his shoulders to hold the two up. Those are still available, but these days, the simple sandwich board has been taken to a whole new level. If your nonprofit has an army of volunteers, we can create colorful “thought bubble” signs that are lightweight and attach easily to your helpers. This is great for raising awareness for your cause on the busy streets or at events. You can also try giant rectangular signs that strap onto the back of your employee. As they walk the busy sidewalks, passersby will naturally be interested in the sign’s message. We can even incorporate LED lighting to make human billboard handheld signs stand out at night. In the short time that sign spinning has been around, it has develop into an art form. Sign spinning is based on the psychological principle that the eye is naturally drawn to motion. So, if you hire someone to stand along the roadway holding your sign, motorists and pedestrians alike will look at the marker. Just moving the sign from side to side will work fine, but really creative sign spinners in Glendale, CA now flip and spin the sign, passing it behind their backs like a Harlem Globetrotter with a fresh basketball. We design markers that are easy for your employees to throw around on slow days. We can even create arrow spinner signs that point the way to your storefront. There is a reason why sidewalk signs are still popular: they work. Human billboard signs in Glendale, CA are hard to utilize in all areas. Fortunately, a well-placed A-frame sign will get the attention of pedestrians as they dodge the marker blocking their path on the sidewalk. There are dry erase and chalkboard A-frame signs, so you can constantly update your message. We can include your logo, so when your clever quote or other message is photographed and shared on Facebook, you will boost your brand as it goes viral. These are just some of the top ways businesses are getting their name out there these days. Banners are another effective option due to their size and versatility. If you are interested in learning about marketing signs that are right for your enterprise, contact The Sign Studio today for a free consultation! Need Sign Installation, Repair or Maintenance Services in LA? Your signs may be the most effective marketing tools you have available to you. You can let everyone in town know where you are with a one-time investment. You need quality markers no matter what industry you are in or how big or small your organization is. Unfortunately, though, if your signs are in disrepair or poorly installed, not even the flashiest markers can help you. When you need sign maintenance and repair for Los Angeles, there is no better sign shop for you to turn to than The Sign Studio. What Sign Repair and Maintenance Services Are Available? Sign Cleaning – It is a smart idea to have your markers routinely cleaned inside and out before they can have a negative impact on your business. This will prevent malfunctions and extend the life of the sign by keeping debris, such as leaves and dirt, from building up. Added Sign Protections – With our sign maintenance we can ensure your investment lasts for many years to come by installing an overhang to shield yours signs from the elements, adding graffiti resistant coating, or putting on a coat of UV protective paint. Fixing and Updating Illuminated Signs – There are several reasons why illuminated markers may not be lighting correctly, such as an animal getting to the electrical equipment or a burned out light bulb. We are skilled at troubleshooting your problem and fixing it. In addition, we can update most neon signs to LED, a much more energy efficient and environmentally friendly option. So, you got a great deal on a sign from an online supplier, and now, you are stuck with trying to figure out how to install the new marker. No problem! 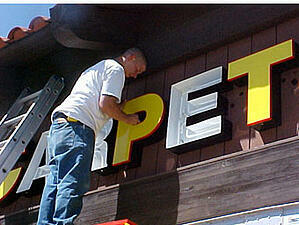 Our friendly experts are happy to help you with sign installation services for Los Angeles. It is important that you go with a professional because much of the time the warranty for a sign is void if a non-certified installer is used. Also, you probably do not have the expensive, specialized tools to do the job right and make certain your new signage looks great for many years to come. There are some sign companies on the Internet that offer adequate customer support. However, for the most part, these shops are hard to find. You may even be able to install your sign on your own. But, when the sign malfunctions, who are you going to turn to? You may be able to get the online supplier to repair it by shipping it back to them. Meanwhile, potential customers cannot find you because your storefront lacks signage. On the other hand, you can usually count on your signs being fixed within hours when you pick a local sign company for repair and maintenance. Within minutes of getting your call, The Sign Studio dispatches our troubleshooters to your location. Ideas to Advertise Your New Business in Burbank CA! Are you still in the process of remodeling your new venue to fit your needs? Banners are the perfect way to shield your construction zone from the public while creating a buzz about your new organization. 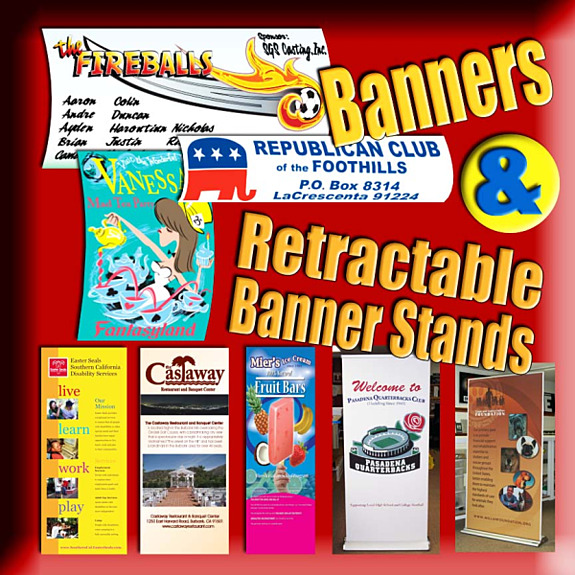 Digitally printed banners can feature your branding in bright, sharp colors. Once you have a specific date for when you will open your doors to the public, we can update your banner with your grand opening date at a fraction of the price of buying a whole new banner. If your new digs are in a spot that gets a lot of foot traffic, you simply cannot pass up A-frame sidewalk signs. These markers put your message directly in the path of potential clients. As with the banners, A-frame signs can help with your branding by matching your other marketing materials. Sidewalk signs are most often used to showcase daily specials, top selling services and products, and upcoming sales. 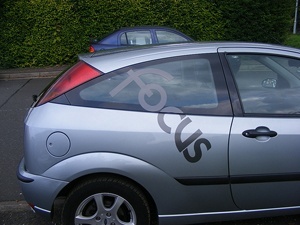 Vehicle graphics are one of the most memorable advertising solutions available today. Unlike exterior building signs mounted to the façade of your venue, vehicle graphics are ads that travel to the consumer, there is no permitting needed, and there are few local restrictions. Best of all, you can reach up to 70,000 people per day according to a recent study. In addition, since your company car is typically driving around your service area, you are reaching your target audience as you travel to jobsites, make deliveries, and run errands. 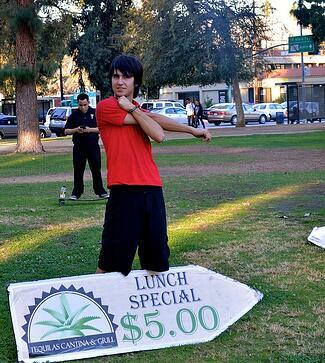 When looking for cheap ways to advertise your new business in Burbank, CA, yard signs are a must. These markers generally consist of aluminum stands and coroplast sign materials. Our state of the art, wide format digital printers can print directly on to coroplast. Yard signs are easy enough to install on your own and inexpensive enough for you to buy dozens of them to place on street corners throughout your service area. These are just the tip of the iceberg when it comes to your signage options. Window and wall graphics are quickly becoming a staple of successful businesses. Point of purchase signs are a great way to drive impulse buys. Also, do not forget to outfit your new facility with the appropriate ADA signs required by law. If you would like help figuring out the best way to get signage for your organization, please consider contacting the friendly experts at The Sign Studio. Give us a call today for a free, no strings attached consultation and quote.